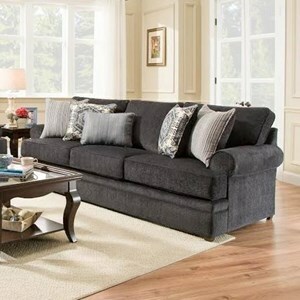 Add seating to your living room with this stationary sofa. This piece features two types of upholstery for a look unlike others. 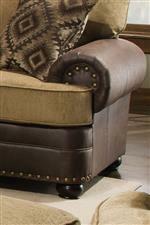 Oversize rolled arms sit on either side of the t-seat cushions and feature nail head trim. The deep seats make this sofa a comfortable place to sit. The 7541 Rustic Style Sofa with Nailhead Trim by United Furniture Industries at Household Furniture in the El Paso & Horizon City, TX area. Product availability may vary. Contact us for the most current availability on this product. Leg or Skirt Wood bun feet. 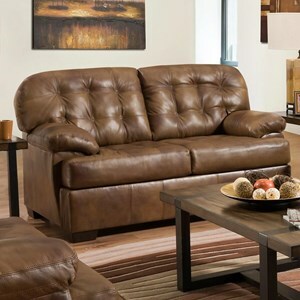 Rustic in style, this collection brings you stationary furniture for your living room or family room. 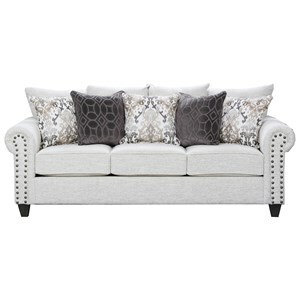 Pieces in this collection feature two types of upholstery, oversize arms and nailhead trim. Deep seats allow you to sink back and relax. 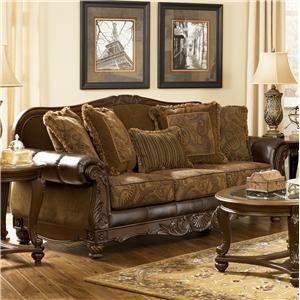 The 7541 collection is a great option if you are looking for Traditional furniture in the El Paso & Horizon City, TX area. 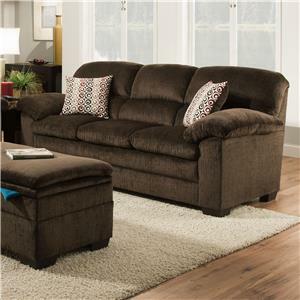 Browse other items in the 7541 collection from Household Furniture in the El Paso & Horizon City, TX area.